TAMPA, FL-Unquestionably one of Tampa's most engaging nightspots, the recently completed Dallas Bull is home to the area's country music crowd. The 34,000-square-foot venue draws national acts in addition to popular local artists. Built from the ground up at a cost of $6.2M, the Dallas Bull is located adjacent to the Florida State Fairgrounds, just four miles from the Old Bull-the original club, which was effectively two trailers butted up against one another. On the main stage of Dallas Bull, four D.A.S. Audio RF-15 loudspeakers are flown quasi-array on each side of the stage while another six RF-15s surround the perimeter. Four Salvin S218 Dual 18 subwoofers can be seen underneath the stage. Kingston, NY-based Salvin Sound & Lighting, a design/build firm specializing in AV, lighting, and special effects integration, handled all aspects of the club's sound and lighting infrastructure. 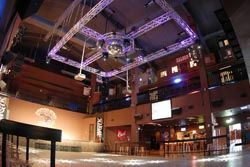 The club features music and entertainment on two levels, with the lower level being home to live performances and the upper level geared toward pre-recorded playback and dancing. The Dallas Bull also utilizes a considerable amount of lighting and video capability. A DMX control system manages both the stage and ambient lighting throughout the facility, and there is extensive use of plasma displays at the club. These are used predominantly for carrying live performances to all areas of the facility, and serve double duty for the playback of sporting events and advertising spots. As a live entertainment venue, audio facilities are extensive and revolve around several products from the D.A.S. Audio product catalog. The SR system is structured so as to facilitate independent control for the upper and lower levels in addition to having the ability to operate as a single, unified setup. On the lower level, the stage area has 14 D.A.S. RF-15 loudspeakers, a 2-way, non-powered design featuring a 15-inch LF transducer coupled with the company's M-10N compression driver, utilizing a neodymium magnet structure and a 3-inch voice coil. Four enclosures are flown on each side of the stage, while another six RF-15s circle the room's perimeter. For on-stage monitoring, the house provides four D.A.S. ST-32 2-way, passive floor wedges. Sub bass chores are handled by a proprietary Salvin design-the S218 Dual 18 subwoofer, which houses two D.A.S. 18-GN 1,400-Watt LF transducers with a neodymium magnet structure. Four such subwoofers are located underneath the stage. A Soundcraft GB8 40-channel console resides at FOH, along with two D.A.S. DS-112 loudspeakers for monitors. Loudspeaker management is provided via Shure P4800 system processors, which also reside in the upper level area and enable independent or summed control of the two main audio zones. Additional signal processing tasks are handled via Rane C4 compressor/limiters, G4 gates, and DEQ 60 EQs. Video for the live performances is shot from a station adjacent to FOH and is then matrixed throughout the facility. According to Vincent Conigliaro, president of Salvin Sound & Lighting, "We chose the D.A.S. product for several reasons-first and foremost being their sound quality. D.A.S. products are routinely requested by performers in the country segment of the music market, and we've had very positive feedback from a number of acts. Additionally, it's very versatile equipment. The rigging hardware is first rate and provides greater flexibility in terms of hanging points than many competing products-making installation easier." On the upper level, eight D.A.S. DS-112 loudspeakers-a 2-way passive design incorporating a 12-ich LF transducer and a 1-inch throat compression driver-form the nucleus of the SR system. These are complemented by four Salvin S218 Dual 18 subwoofers. Amplification for both upper and lower level loudspeaker systems is provided by QSC RMX and PLX series power amplifiers. Reflecting on the project, Conigliaro offered this closing thought, "When all was said and done, the project's success was a direct result of good project management, a thorough understanding of the client's expectations, uncluttered design, and the right products. The system sounds great, and we routinely find that upon hearing the D.A.S. system, the acts decide to use the house system. They come in; they listen, and then say, 'Leave the stuff in the truck.' That's music to my ears!"